While linens and bright colours were the summer months’ prominent trends, attention is now quickly turning to the looks and styles that will grab attention this autumn and winter. 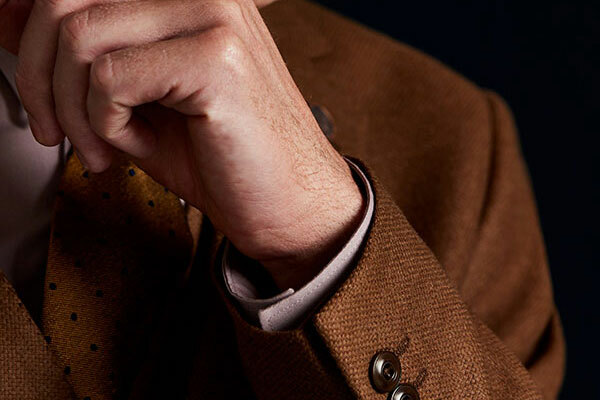 In many circles, the check is recognised as the most popular pattern in men’s shirting, and more recently in suiting, and it will once again feature prominently this autumn and winter. From subdued tones and micro-scale to intense tartan, there is no doubting the importance of the look that a classic check can create. And traditional checks remain a strong part of that trend, including plaids, windowpane and Prince of Wales patterns. The check’s impact spans beyond shirts, too. The checked suit remains a staple for men of every age and is often spotted in the office, at parties and at the races. Achieve a modern look with a single-breasted, two-buttoned jacket, paired with a skinny or slim trouser, or experiment with a double-breast in a bolder check to make a more eyecatching statement. 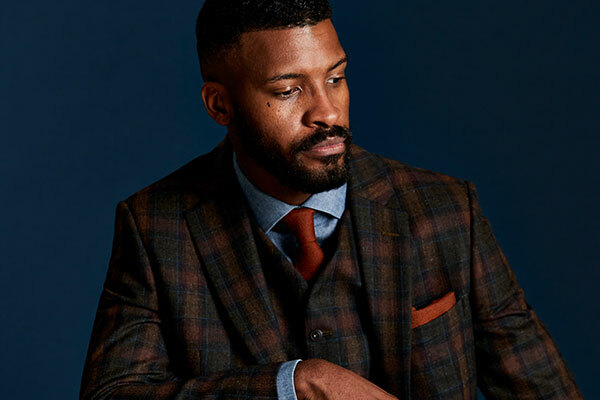 The Gibson London herringbone check suit comes in blue, berry, coffee brown and forest green, and each is lined with a signature map print, and features a removable compass pin. 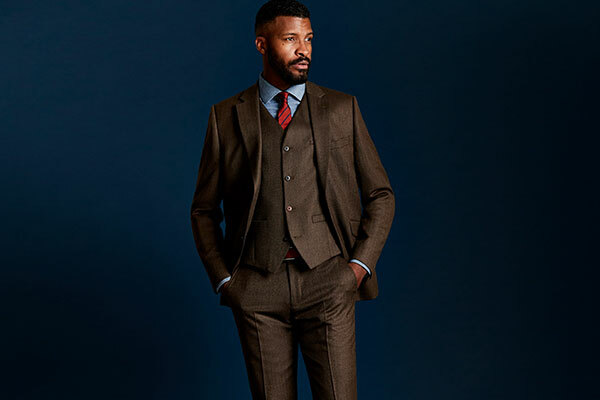 Our suits deliver a head-to-toe tonal look, from electric blues to rich reds, and each will help you achieve stand-out, as we transition away from the more neutral pairings of spring and summer. For a more daring colourway, camel is a strong option and perfect for your next day at the races or wedding reception or turn down the formality with knitwear and create a look that suits an afternoon at a country pub or a casual office. The traditional patterned knit has re-emerged as a key trend, while chunky knits and textured designs help you achieve a more relaxed look or add a casual twist to an otherwise formal outfit. Utilise browns, oranges and reds to build an essential autumnal palette and add contrast with richer pops of colour in the check. Mixing and matching continues to grow in prominence, and we expect to see even more of it this autumn and winter. 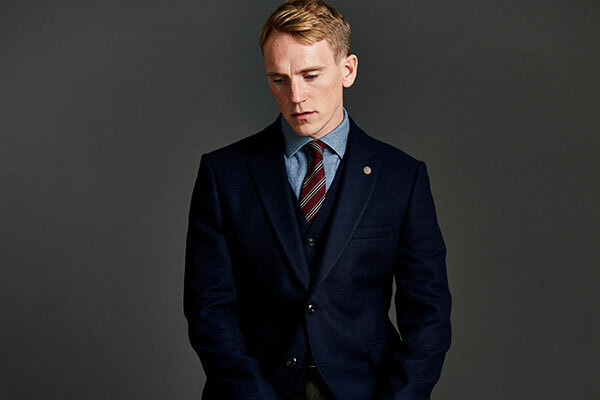 All items from Gibson London’s suit collection can be purchased separately, which creates the opportunity to build new looks. Easily match a blue jacket with forrest trousers, or a green jacket with a brown waistcoat - mixing and matching can help you achieve stand-out in all kinds of environments, from the office to your next formal social gathering, while also helping you create entirely new outfits from existing items in your collection. Across all environments, business or social, Gibson London’s range, influenced by the bold fashion and attitude of the modern urban lifestyle, provides the perfect starting point for your autumn-winter wardrobe.